How do I hire the best candidates and avoid mis-hires? In this era of talent wars, organizations struggle to hire and retain the talent they need to effectively compete. Acquiring, developing, and retaining top talent requires knowing what makes employees succeed in specific jobs. Job Success Formulas (JSFs) are a key to winning the talent wars. 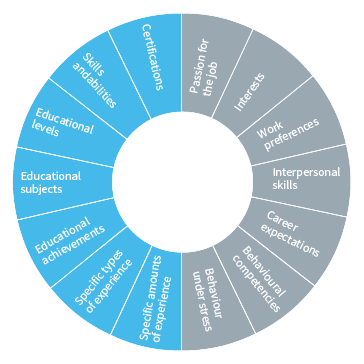 Employment assessments need to measure applicants against those job specific success factors and give employees clarity about how they can succeed and what tendencies they need to avoid. Harrison's employment assessments provides more than 6500 proven and pre-configured Job Success Formulas to help your organization easily and accurately predict job success. Each formula identifies and measures the qualifications (eligibility) and behavioral requirements (suitability) needed to succeed in the job. JSFs identify people who are both eligible and suitable. JSFs can be easily adjusted to match requirements for your specific job within the system and can be optionally reviewed by Harrison Expert Job Analysts. The JSF provides a weighted scoring algorithm that generates an overall score based on a scoring formula that reflects the impact of each possible answer. The overall score indicates likely performance. Harrison Assessment's Job Success Formulas are developed from 30 years of world-wide job performance research and provide a comprehensive integrated hiring system. 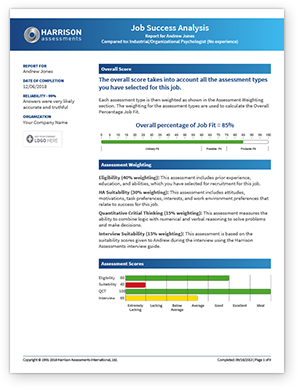 The final employment assessment score measures candidates' eligibility, suitability, and interview scores against the ideal candidate for the position in your organization.